Check-in is after 5 p.m. on Sunday, with check-out on Friday before noon. Our courses are held in a large classroom, located at the Seven Springs Mountain Resort Conference Center, that is used for both teaching and the hands-on workshops. Students can interact and socialize with each other during breaks, at meals, and after hours. 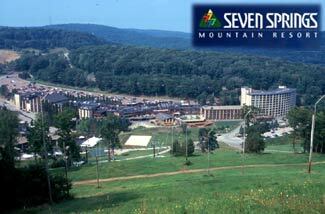 Seven Springs Mountain Resort is located high in the scenic mountains of western Pennsylvania. This relaxed conference setting and the facilities of this mountain resort allow students the chance to socialize, or to seek out peace and solitude when and if they want it. The resort has outstanding recreational facilities which include ski slopes, an Alpine slide, golf course, swimming pools, weight rooms, exercise rooms, racquetball courts, tennis courts, hiking trails, running paths, fishing, pool tables, game rooms, mountain biking, and more. Hiking after class on the Laurel Highlands Trail is always popular with students. This walk on the ridge of the mountain provides a breathtaking view of the valley below. Students are housed together on the same floor, normally on the slope side of the ninth or tenth floor, in the main hotel. All rooms have a balcony with an astounding view of the surrounding area. Students can walk to and from classrooms and dining facilities. AVNC sets aside a block of rooms for all students with confirmed reservations, and does the booking of rooms for all registered students. Rooms are $128 per night for single occupancy. Room prices include an outstanding buffet breakfast. Family rooms are also available on a lower floor; but students must contact AVNC to get one of these rooms. AVNC has also arranged for government rates that will meet the per diem needs of government employees and contractors. Lodging expenses are not included in the tuition, and the individual bills of each student need to be paid directly to Seven Springs by cash, check, or credit card. Seven Springs will invoice your company if necessary. 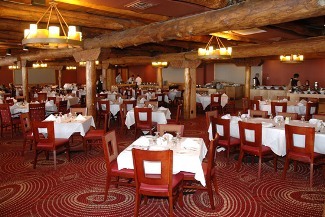 Seven Springs has a wide array of dining rooms and food services that range from elegant gourmet restaurants, to formal and casual dining rooms, to casual eateries. These include coffee shops, pizza shops, and bake shops. Students should dress for seasonably cool weather since Seven Springs is in the mountains, and casual dress (jeans, etc.) is appropriate. A seasonal jacket is suggested for after-class activities. Good walking shoes and comfortable walking clothes are also suggested. The Seven Springs Resort is so enticing that repeat students bring their spouses or entire families. The Seven Springs Conference Center staff is dedicated to making everyone's stay a pleasant one. Trustworthy babysitting services are available through the Seven Springs Conference Center.